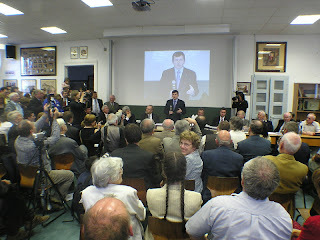 Charles Simonyi on the meeting with radio amateurs and students hosted by the Puskás Tivadar School for Telecommunications in Budapest. Charles Simonyi, Spaceflight Participant, Soyuz TMA-10 visited Hungary on 30th April and met with professionals for a one-hour interactive talk. Report in English will follow in the SDI/Digital Earth context on www.unsdi.hu soon.